Sweet and Sour Pork Recipe - Best Pork Recipe here, follow these simple instruction to cook pork recipe within the easiest way. Cut pork into bite-sized pieces and place in a medium-sized bowl. Season with pepper and add soy sauce, garlic, and green onion. Cover and let marinate for 1-2 hours. Coat pork pieces with egg, dip in cornstarch, and fry until crispy and golden (about 2 minutes). Drain on paper towels. Heat 1 tablespoon of vegetable oil in a skillet over medium-high heat. Add the onion and bell pepper. Once the vegetables start to become tender, add pineapple with syrup. Stir for 30 seconds before adding vinegar, soy sauce, ketchup, and sugar. Stir regularly over medium-high heat for 3-4 minutes as water evaporates and sauce thickens. Add the pork to the pan once the sauce begins to thicken. Stir to coat evenly. Garnish with additional green onions and a sprinkle of sesame seeds. 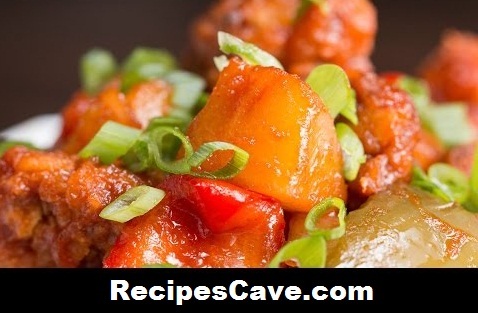 your Sweet and Sour Pork Recipe is ready to taste.